PXI Controller, 6U i7 Controller - GX7927 | Marvin Test Solutions, Inc. The GX7927 is a Single Board Computer (SBC) that features the high performance, highly integrated Core i7 processor platform from Intel. Core i7 offers an integrated graphics and memory controller plus dual core processing, operating at speeds up to 2.53 GHz. Coupled with the Mobile Intel QM57 Express Chipset, the GX7927 provides an unmatched level of I/O bandwidth for both onboard and off-board functions. The module is supplied with 4 GB of DDR3 SDRAM and 16 GB of NAND Flash memory. Both standard and extended temperture operation range versions are available. 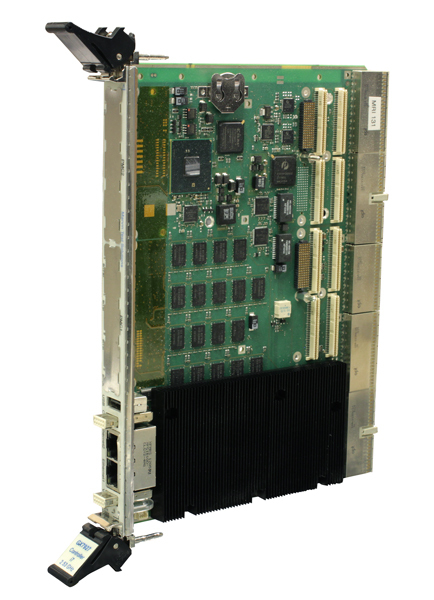 The GX7927 is a single-slot 6U controller for use with Marvin Test Solutions' GX70xx and GX71xx series chassis. The GX7927 offers multiple peripheral connections including USB, Ethernet, COM and VGA. When combined with the embedded storage peripherals of the GX70xx and GX71xx Series chassis, it is the ideal solution for a compact, high performance, and integrated PXI chassis / controller configuration. Additional flexibility is provided by the two front panel accessible PMC / XMC slots, which can accommodate a variety of interfaces and functions for specific applications or needs. The GX7927 controller supports multiple peripherals and I/O interfaces through either the controller’s front panel or the rear I/O panel of the GX70xx or GX71xx Series chassis. Connection to the DVD-RW drive and hard drive is via the controller’s internal I/O interface. The controller’s front panel I/O supports VGA, one USB 2.0 port, two Gigabit Ethernet ports and one COM 3 port. Additional USB, VGA, COM and Ethernet connections (chassis model dependent) are available on the rear panel of the GX70xx and GX71xx chassis via the controller’s rear I/O interface. The GX7927 features two PMC / XMC slots which support 64-bit PCI, 133 MHz in PCI-X mode or PCI Express x8 (Gen2, 2.5 Gb/s) for XMC applications. The GX7927 series controller ships standard with Windows 7 Pro operating system. Please note that Windows XP Pro operating system is also available for this series, and should be specified when ordering.